Bag Ladies unite! - Stop staring and start sewing! When I started selling hand crafted things on ebay I only did purses and diaper bags because they were fast, fun and don't require much fabric (I'm totally tired of them now). I was invited to join a group of other gals who made bags and it turned out to be the nicest group. Everybody was easy going and generous in sharing advice. Well, the place is a flippin' ghost town now since everybody found etsy and while I miss our little chats, I'm happy to see my friends (or "virtual friends" as Joey refers to them. Whatever.) finding fame and fortune in what they do. 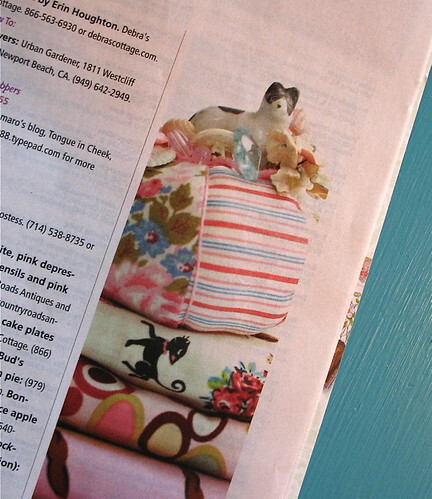 This month two of my bag lady friends are in Romantic Homes magazine! I think this is one of the prettiest magazines out there and their creations fit in just perfectly. Beth makes such beautiful bags but I think her pincushions are even more impressive and unique. And Beth has a little not-so-little secret. She's a published author. Of bodice rippers. Really (I know, scandalous). 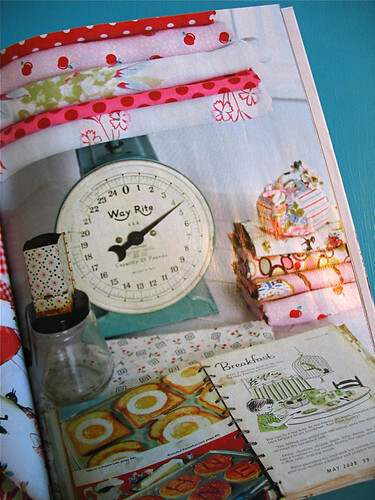 Here's her darling little pincushion in the magazine. See it sitting there on that pretty stack of fabric? They even put a bigger picture in the back. Isn't it cute? And to be honest, this one isn't even the cutest of her pincushions. One time another person on ebay started copying her pincushions (it was so blatant it didn't even fit into the "inspired by" category) and we all said "don't worry Beth. Her stuff is crap and she'll be gone soon" (I think the copycat may have been the recipient of a few pointed emails too. Just maybe.). I have no idea where that copycat is today (probably in therapy over those scathing emails) but Beth is published in Romantic Homes, so there's a lesson to be learned. And my friends Kelci sells zillions of bags on etsy (I think I've sold an incredible 2) and in local boutiques. She's a hot item I tell ya! 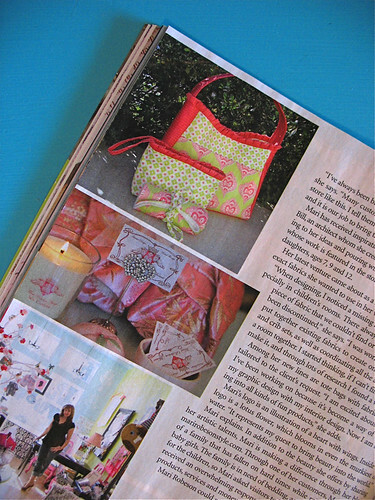 One of the boutiques is featured in the magazine and includes some beautiful bags Kelci made. She is also published in a local magazine (she lives on the Coast in central California but don't hate her for it) too! Dang girl! Aren't these gorgeous (I hope they're selling for a fortune! )?